This page will show a variety of projects that we have completed in the past. Hopefully, this will give you a good idea of the extent and level of work we are capable of doing. 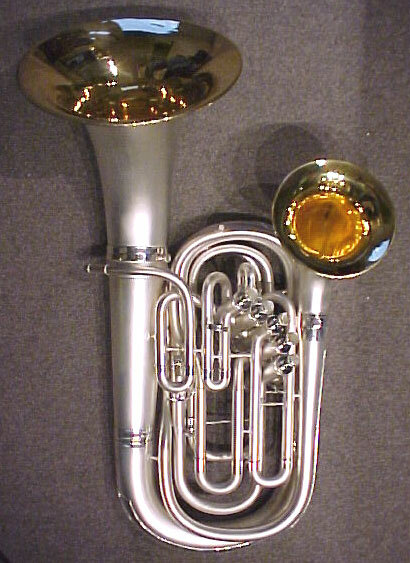 Constructed from what was once a standard 1930s Conn 80-A cornet, this beautifull "pocket cornet" was designed and created by Daniel C. Oberloh for and on behalf of the membership of the Pacific Northwest British brass band, PugetBrass as a gift to its Conductor, John Falskow. The instrument was finished in frosted and bright 24k gold plate, its presentation case was built by Robert Read and Daniel O. and was made of walnut and maple with brass hardware. Recently we were going thru some images of past projects and stumbled across a few that we found a little interesting so we thought it might be fun to share a few as time allows. 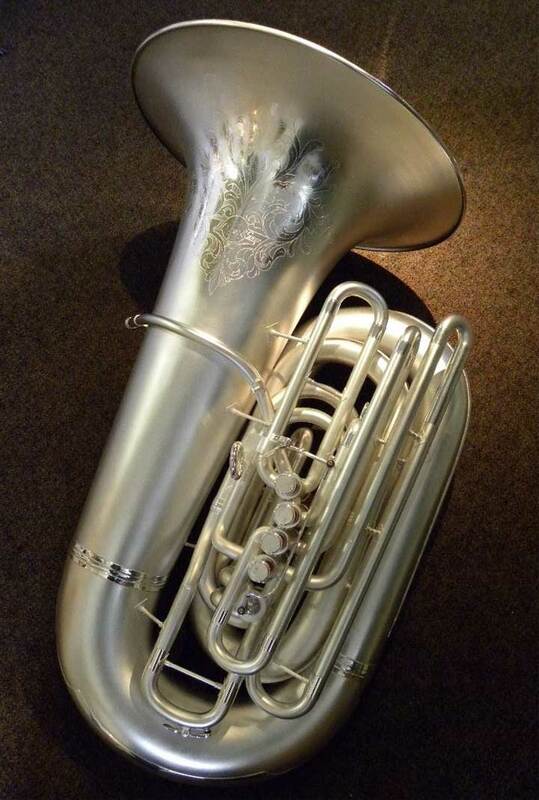 Seen below is a before and after shot of a BBb tuba Daniel Oberloh restored a while back. 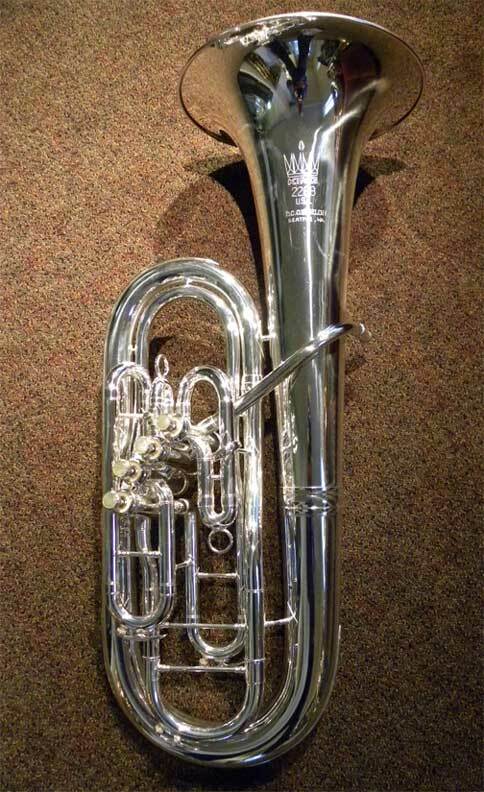 What we call a Crown model was made for many years by the brass instrument manufacturer B&S. This one was probably built in the mid to late 1960s and is often labeled Crown Professional, Karl Ziess, L'Rae, Sonora, Gerhard Sneider, Giardinelli and others. 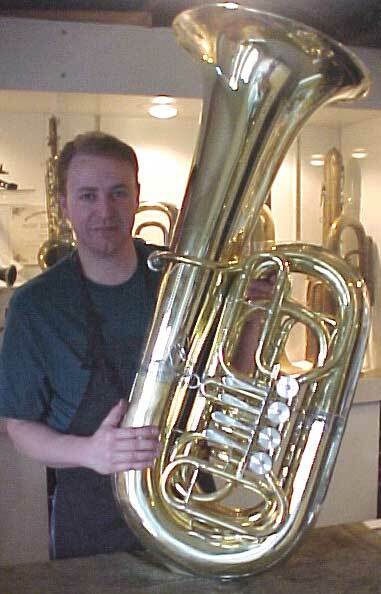 When it arrived at the shop, is was a bit rough but in much better shape then most tubas we receive. The owner had no interest in using it and chose to sell it to the shop. We eventually set to work squaring it away. 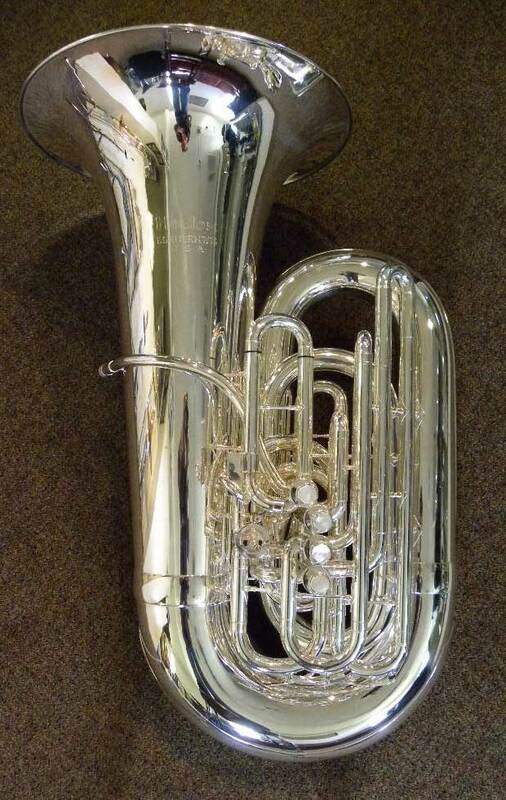 This model is relatively common and is typically a very nice playing tuba with very good build quality. Reproductions of the Crown are currently made in Asia and though they are okay playing horns, they should not be considered at all equal to the German made original. Sorry for the low quality of this set of pics, Technology has a way of spoiling us. 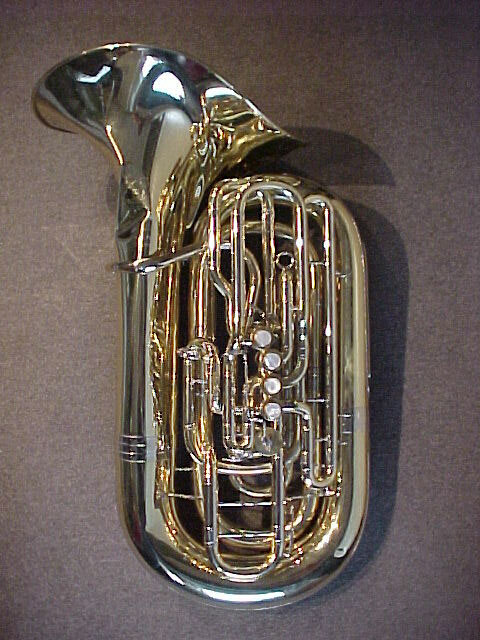 Some instruments are just not as common as once may have been the case and the double-bell euphonium falls into that catagory. Seen here is Daniel C. Oberloh with two examples at the completion of there beirng restored. To the left is a ''stencile model'' branded American Educator made in the late 1920/ early 30s. 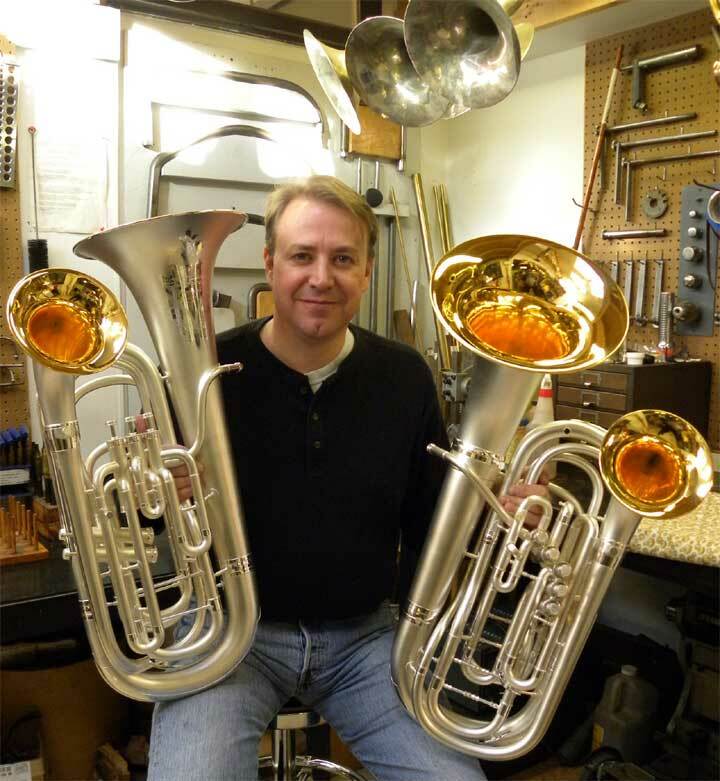 To the right is a CG.Conn model 30-I that is arguably the best double bell euphonium ever made. 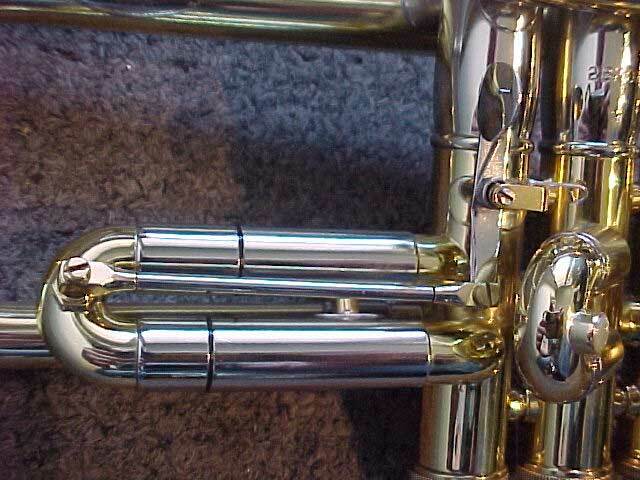 Both instruments required extensive repairs to the valves and considerable dent removal prior to being silver plated with bell interiors plated in 24k Gold. restored by Daniel Oberloh. A recently completed project that was a long time in the making. 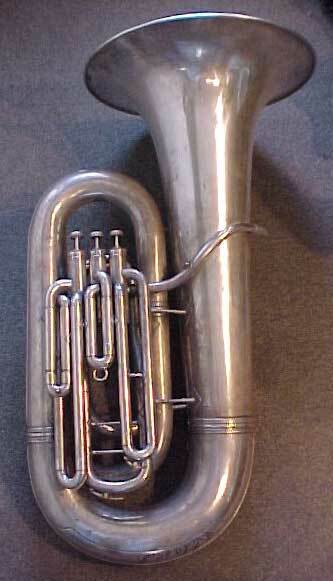 The original configuration of this BBb tuba made in 1914 by J.W.York of Grand Rapids Michigan was with only three ³top-action¹¹ valves. The instrument was reconfigured to four front-action piston valves, with a thumb opporated rotary fifth valve. In addition to restoring the original body of the horn, roughly 90% of the braces seen were reproduced from scratch as was the No. 6 branch, all tuning slides and 5th valve branches, mouth-pipe and receiver, thumb-ring, 5th valve lever and linkage. The valve block assembly and rotor valve assembly were pupplied by sources in Germany. It was refinished in a frosted silver plate, the same finish it sported when new. Designe, parts fabrication and restored by Daniel Oberloh. Every now and then we get called on to restore some pretty fun instrument designs. 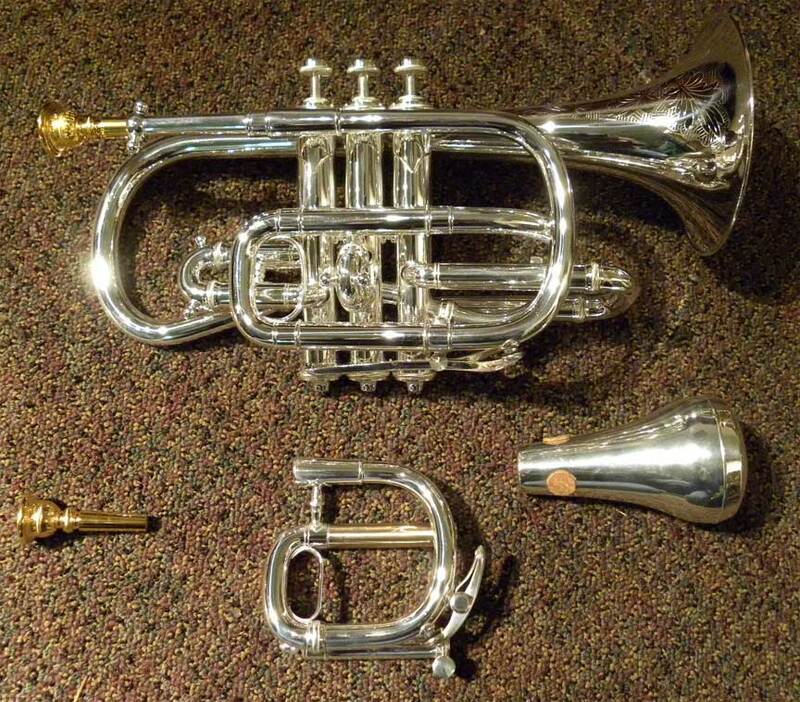 The two instruments shown below are from the collection of one of our customers who has a strong interest in the more unusual American trumet and cornet models. 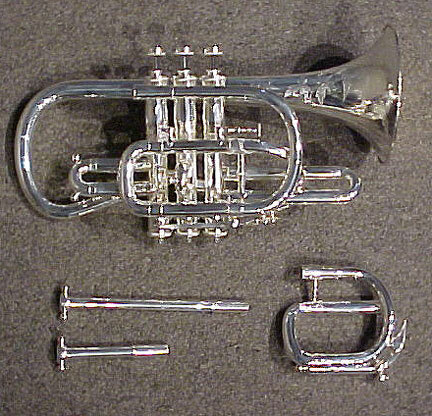 The first being ''The 400'' Buescher cornet made in 1956. Lacquered brass and nickel-silver finish. Restored by Daniel Oberloh. 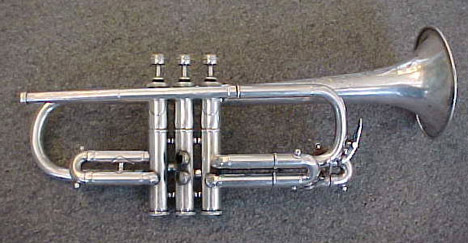 The second being ''The 400'' Buescher trumpet made in 1947. Lacquered brass and nickel-silver finish. Restored by Daniel Oberloh. A big thankyou! to the owner of these two instruments, Nan Abbott for her patience and trust. Another one of those fun old models. 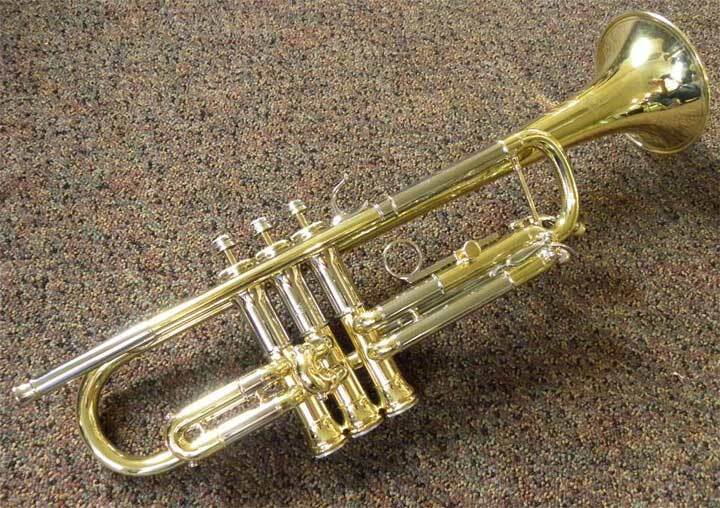 The C.G.Conn ''Victor''model cornet was originally the C.G.Conn ''New Wonder'' model when it came out in the ninteen-teens.This one was made in the early '50s. Also known as the ''Opera-glass'' because of the fine tuning device in the bell crook. Our friend Spike in Oregon, has a thing for these old beauties and wanted this one restored completely.Lacquered brass and nickel plate finish. Restored by Daniel Oberloh. Fully restored with custon fifth valve construction and instalation, by Daniel C. Oberloh. 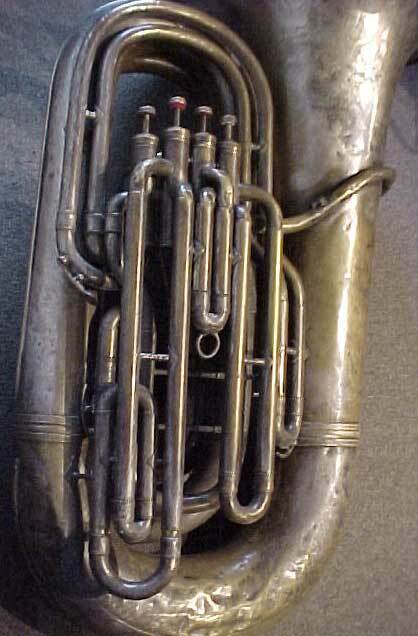 This is one of very few original Holton 345 CC tubas. 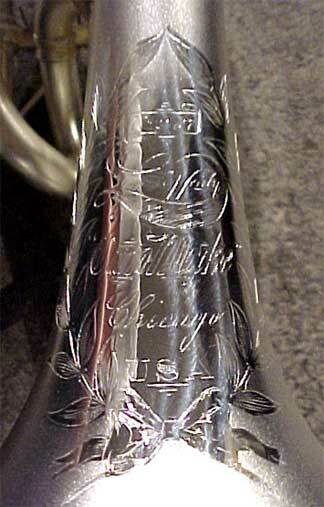 Originally created for Arnold Jacobs, Principal Tuba with the Chicago Symphony from 1944-1988. A truly fantastic instrument and a real challenge to perform the rarther extensive list of repairs and corrections needed. A big thank you to our friend Dale Phelps for his patience with the time needed and allowing us the freedome to address any and all maters with his tuba as was seen fit. 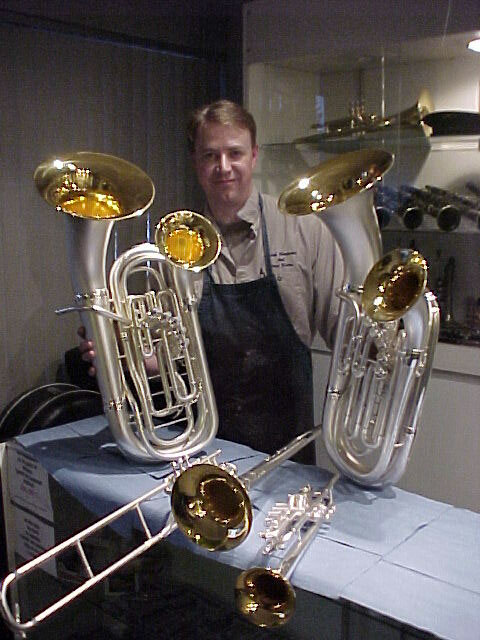 It's no surprise that Oberloh Woodwind and Brass Works restores quite a few Vincent Bach instruments every year. 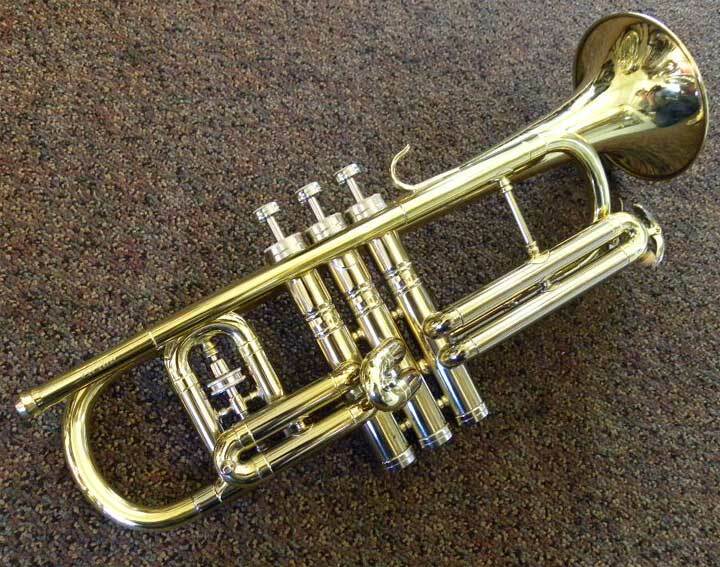 Here is a recently complete V. Bach Bass trumpet that we restored for the Seattle Symphony and Opera. The instrument was also retrofitted with special trigger linkages for the first and third slide. 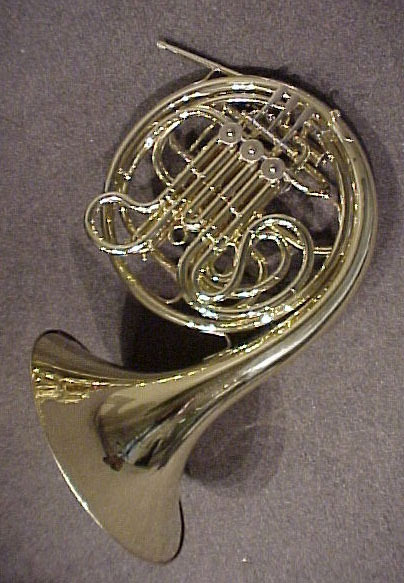 Cool horn! Sometimes its fun to show off the really old ones that come in, not just to be repaired or overhauled but to be resurrected. Here are a few interesting examples of Pre-war V.Bach Stradivarius trumpets that were put through very detailed restorations. 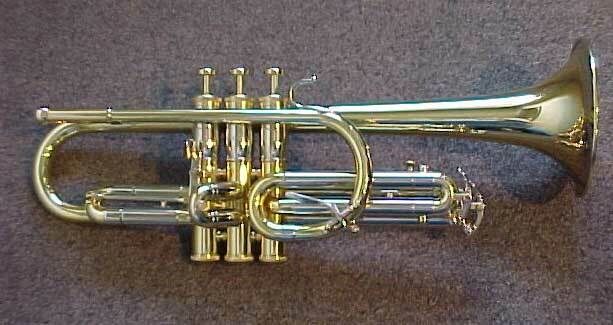 The first is a 1934 era Stradivarius trumpet Model 7-10-62 with a 45 bell. Its owner acquired it in a very sad state of having been crushed. Both bell and valve casings were very badly damaged. It took some time to correct but in the end, it turned out to be a real player and it don't look bad. Here is another one restored by Dan Oberloh. Its a light weight, Model 7-62 with a 48 (I think?) bell. Made in 1939 It was pretty rough as well and was adorn with more then its fair share of patches. Most of its damage was done when an attempt was made to overhaul it long ago. The number of missing parts did not help, the third, second and much of the master tuning slides had to be custom made completely from scratch. Making the third slide lock-nut assembly was no walk in the park because the originals were made of nickel-silver ''hex-stock''; so were the missing draw knobs for the tuning slides. Hex stock in nickel-silver is nearly impossible to find. This being the case, Dan milled his own just for this project, out of round bar stock. We could have put modern parts onthe horn and that would have worked fine but it just wouldn't be right. Such details are important. Like the example above, it was very carefully repaired and buffed to a nice bright finish. The lacquer applied is almost exactly the same as what was on it when it left the factory 70 plus years ago. And the patches? we only used two in the end and unlike all the boiler plate it sported on its arrival at our shop, you will have to look very closely to se the two Dan was forced to installed. Nice horn and it plays quite well! Completed in May of 2010. 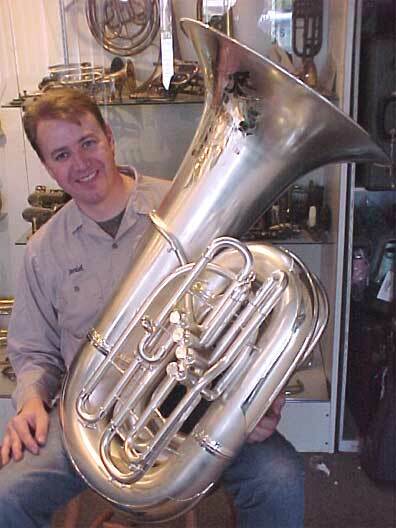 Dan proudly shows off the Holton BBb tuba that he restored over a period of more then five years. These are amazing horns when properly constructed. Saddly this instrument was little more then junk when its owner brought it in. Many components were found beyond salvage as they were in such poor condition or all together missing. Others parts required extensive effort to save as they are not really replacable. 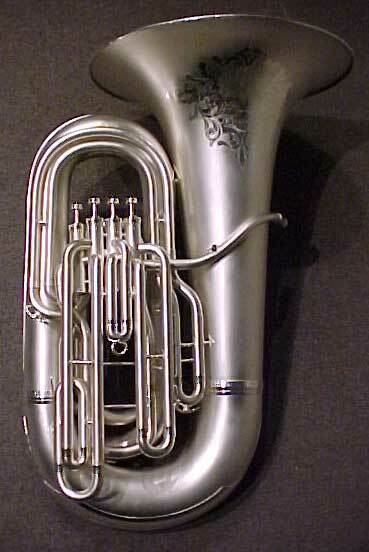 Many aspects of this tuba were improved on without taking away from its overall look and function. In the end, the horn turned out to be a real treasure. What a project. The image above shows the King BBb helicon shortly after its completion. Manufactured by the H.N. White Co. in 1905 for the United States Military. Fully restored by Daniel C. Oberloh in satin silver plate. The valves were also completely rebuilt during the process. 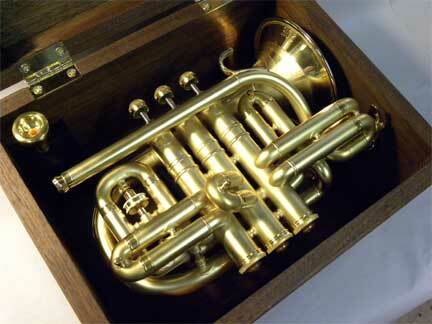 It is the oldest one of its type that Oberloh Woodwind and Brass Works has ever restored. Thank you to our Friend and Customer Mr. Fred Knox for his patience, we hope he enjoys it to the fullest. 1891 C.G. 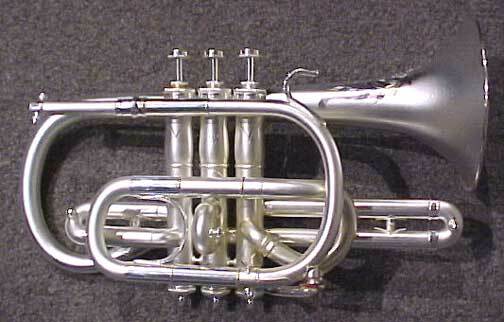 Conn Wonder "Solo Model" cornet. Resoration completed in late 2009. The present owner received it in the late 1930s when he was a boy from his Grand-Father (the original owner). Though it took a while to properly restore, the final results were worth the effort. 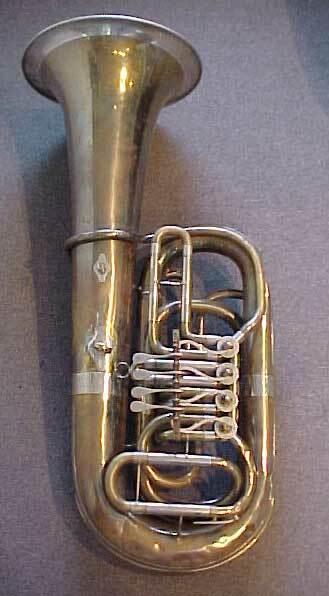 Shown here with its original mouth-pieces, mute and C-slide assembly. Seen before and after. 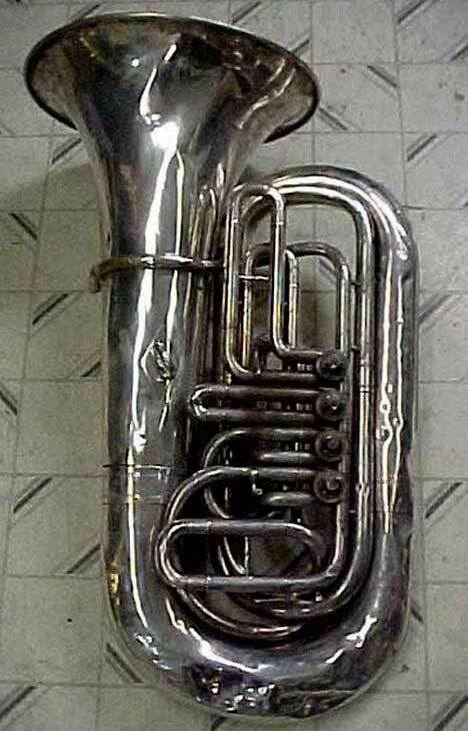 Restoration images of a Hirsbrunner BBb tuba. A rather involved project that turned out for its new owner to be a real prize. In early 2008, Dan received a phone call from a gentleman who had tragically suffered a stroke that had left him minimal use of his right hand. I am sure many of us can imagine the impact this would have on our life and the ability to play our instruments. The caller was desperately searching for someone who could provide him with an instrument suitable for his playing needs. Dan suggested a few manufacturers, he stated that he had already corresponded with them and they were ether unable or unwilling to provide what he desired. The repair shops he contacted were for the most part not very interested for a number of reasons we can completely understand. His need was for a left hand or reversed baritone horn. To be honest, Dan was not real interested in taking on the task himself with all the projects on his bench at the time but after discussing the matter and thinking how upset he would be if he were in the same boat, he agreed to consider the task and eventually accepted the challenge. The original instrument for the project that we received from the owner was one he got off eBay. It was an old King 2268 that was in pretty rough shape. The important part that was salvageable was the valve section which is probably the best one available for such a conversion. The ports were removed, the forth valve cut off and refit and brazed to the first valve. The porting of the first and third valves are so close that with a bit of skill and a little care the block was able to be completely reversed to a mirror image of its original configuration. There were a lot of small alterations along with a good deal of repair work to the casings, pistons and slide tubes but in the end it turned out pretty decent. You can't simply slap these together and it did require a lot of effort but in the end Dan felt the project to be really interesting and worth the time spent. A truly beautiful piece of 1930s Art Deco styling. 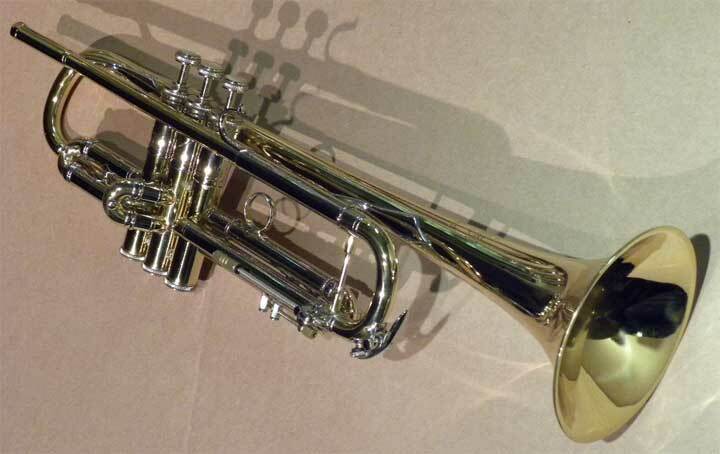 The Vocabell 48-B trumpet made by C.G. Conn ltd. is a favorite with collectors and is still used by those fortunate enough to possess one. Because of the Vocabells elaborate styling points, restorations can be rather involved. If the details are not observed and addressed, all that makes this design so special and visually appealing can be spoiled with little hope of being corrected. 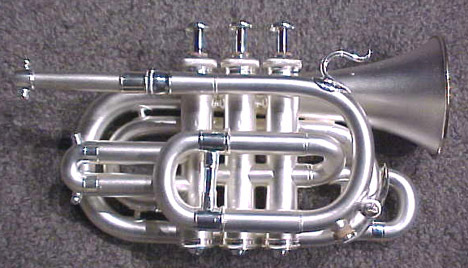 All Vocabell model trumpets have fluted outside valve casing walls and the heavy bell rim is void of a bead and bead-wire. The double wall mouth-pipe is also a neat feature of its design but repairing it can be a real pain. Many but not all are decorated with an art Deco engraved bell pattern that requires considerable care when dents are being removed and metal finishing is performed. This one was restored by Daniel Oberloh and completed in the Fall of 2009. The engraving is original; we are very carfull with such details when it comes to our polishing and take them quite seriously. All work, including polishing, masking and glass bead-blasting was performed in-house. Double silver plating and gold plating of the bell interior was performed by our friends at Anderson Silver Plating Co. Inc.
Another lovely trumpet of days long gone. 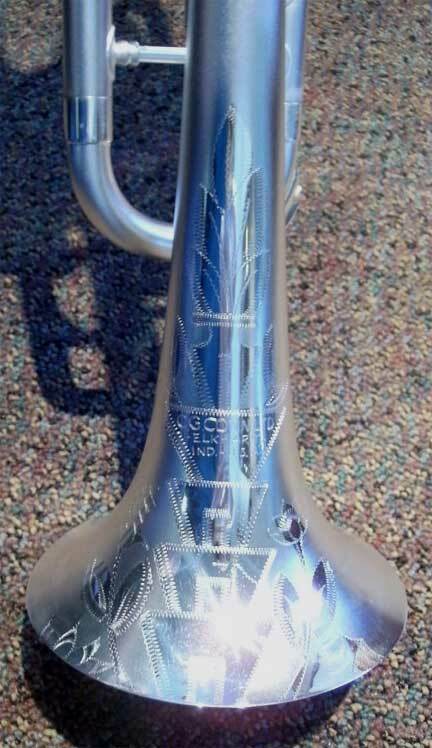 The image above shows a King "Liberty Model" trumpet that was manufactured by the H.N. White Co. around 1933. We fully restored it in double satin silver plate with a gold plated bell interior. The valves were also completely rebuilt during the process. 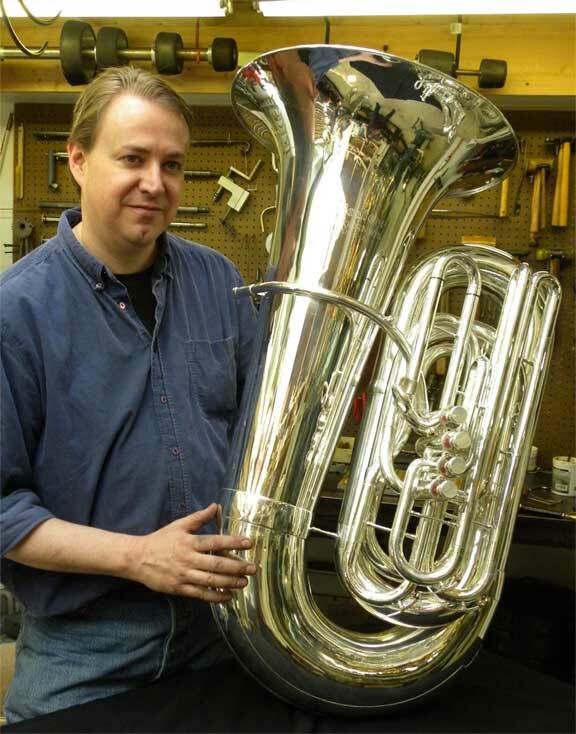 Pictured above is Dan shortly after completeing the restoration of this c. 1910 Alexander BBb tuba. This instrument had been in constant use its whole life. Its current owner had been using it for more then fifty years prior to sending it to us for a little love. The instrument required a good deal of brass work, considerable machineing time to rebuid the rotor valves, bearings and linkage. Our Friends at the Alexander factory in Germany were so very helpfull in providing us with a new custom made bell to replace the original that was beyond salvage. It is safely back in its owners hands where it continues to provide great joy. Above are a few examples of vintage horns restored in our shop over the recent past. These two were produced by the great Carl Geyer of Chicago IL. who provided instruments and repair services to some of historys most notable brass players. 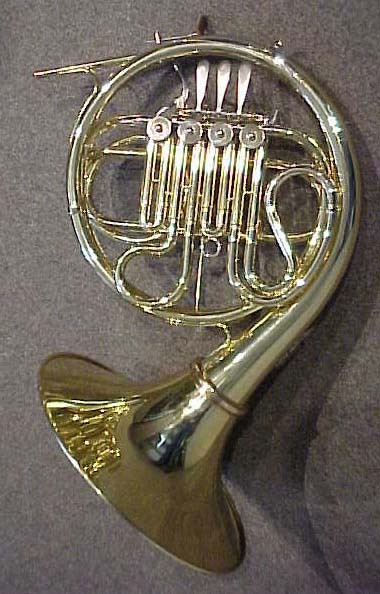 Mr.Geyer produced horns in the US from 1916 to the late 1960s, into his late 80s and is a very much admired Carftsman by Dan Oberloh and many other brass instrument makers and Techs. Inspite of the extensive effort needed to rebuild both horns, it was a privilage to be called on to bring these instruments back to life. Two other examples of Classic French horns we have restored. On the left is an early Kruspe double French horn c.1915-1925. 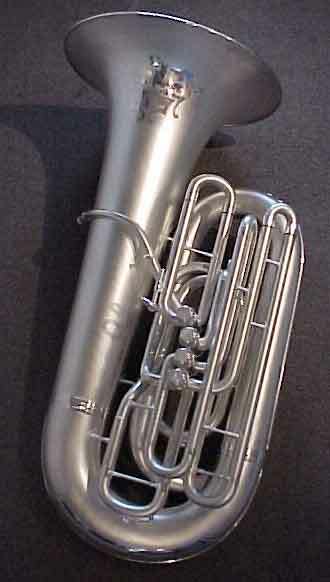 Kruspe was the inventor (1899) of the double horn and his Horner model is arguably the most copied model of any used today. 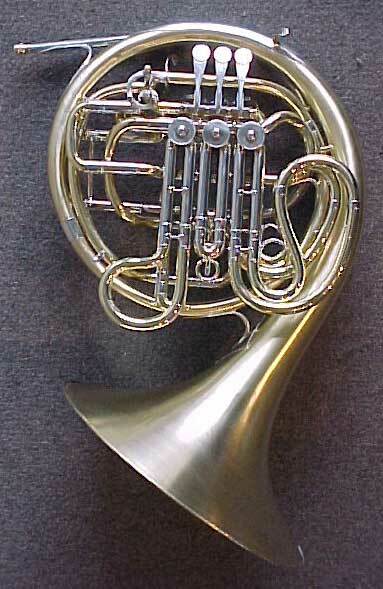 The opposit image is a Vienna valve horn made by Daniel Fuchs of Wien, late 19th century. These two instruments proved to be very difficult to restore. There age and considerable valve issues bore them out to be quite a challange. No, not all instruments are complete restorations. This late model B&S PT-4 CC tuba was subject to a mishap with an automobile and some how wound up under the vehicles wheels in a soft carrying bag. The bell, mouth-pipe and large branches were all badly damaged. Though it took a good deal of time to correct, all of the original parts were repaired allowing considerable savings for its owner. Another WOW! project. 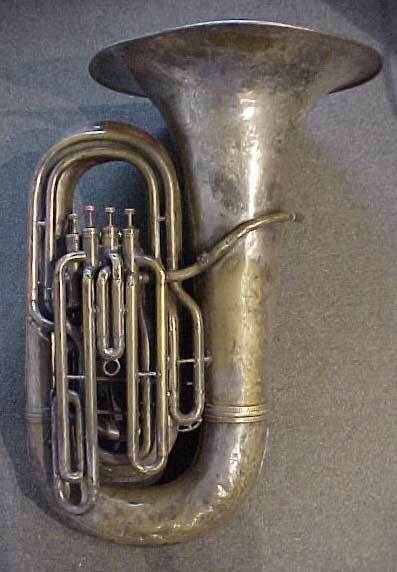 A 1930s York Band Instrument Company BBb tuba. Reconfigured from a standard three top action valve design (Left) to a four front action (Right). 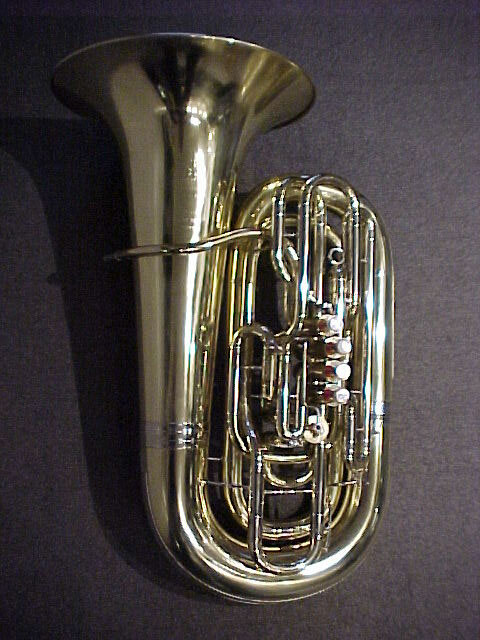 The tuba was converted to be more comfortable to play and with the forth valve and adjustable slides will have greater facility for the player. 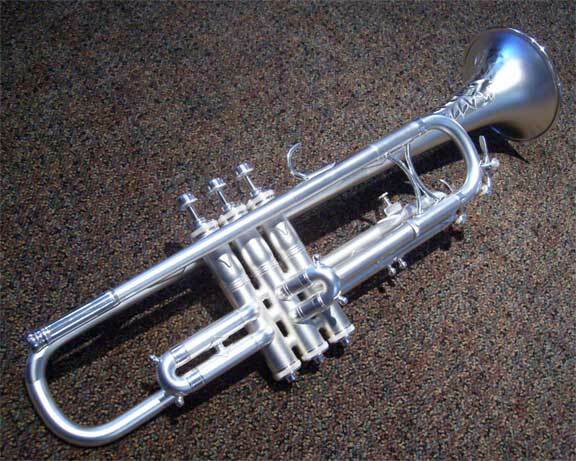 The instrument, following the modfication, was completely restored, glass-bead-blasted and silver plated. The same finish it had when it was new. A very coplicated and involved project to be sure. 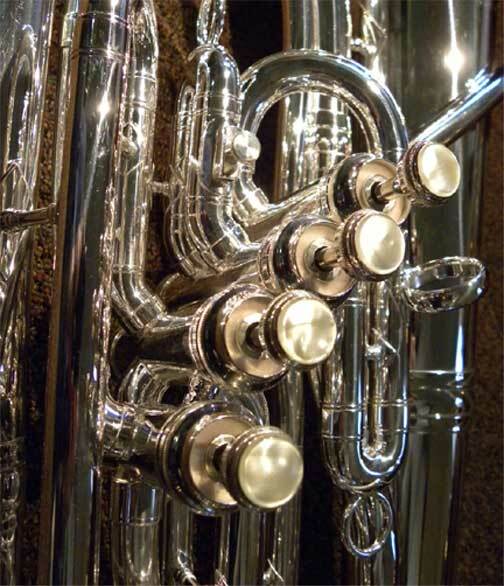 The Besson "Standard" compensating model euphoniums have been a favorite of high school band directors for decades. Shown here are a number of such horns at the completion of there restoration. If cared for, they should last another forty years. Seen above is a (Model 33?) J.W.York BBb Tuba before and after Dan performed his magic. The instrument was manufactured around 1912. It required a considerable amount of work including the fabrication of a new replacement sixth branch, third slide crook, all four top valve caps and buttons along with numerous replacement braces and other other assorted bits and pieces. The bell was re-engraved by Dan as well. The instrument was then glass bead blasted and silver plated in order to have the original look it had when it was new. Turned out to be a real nice playing horn with that distinctive York sound. 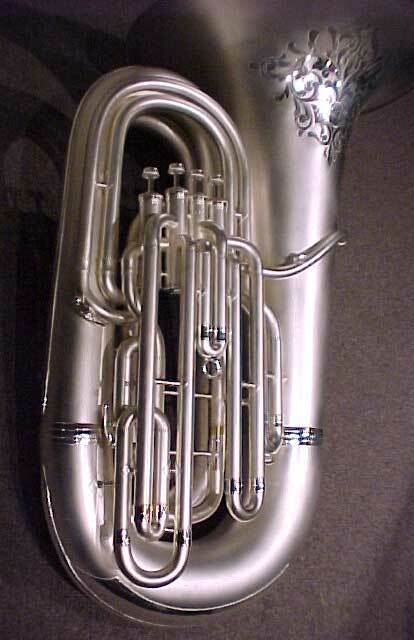 There has been a great deal of interest in double bell euphoniums in recent years. 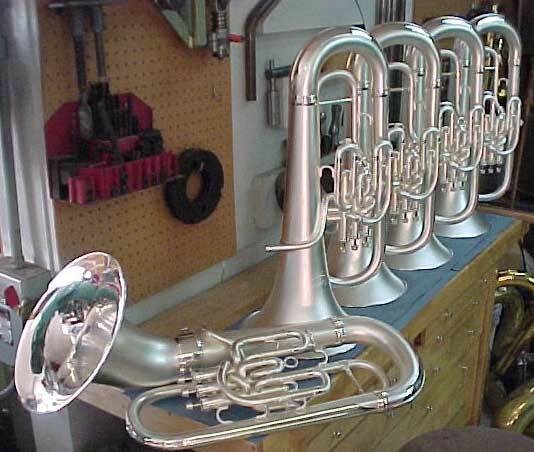 Because they have not been manufactured for more then half a century those desiring such instruments are rescuing the old horns and having them restored. Seen here is Daniel Oberloh with a couple made by C. G. Conn. The pair shown have been completely restored along with a 1907 King valve trombone and a rare Conn 56-B built in 1929. The Double bells shown are a 1921 New Wonder model(right) and a 1945 Short Action 30-I (left). All of these instruments shown were carefully rebuilt by Dan and plated by the craftsmen at Anderson Silver Plating Co. Inc. of Elkhart Ind. They are all satin silver with bright silver highlights and gold plated bell interiors. Above are a few closeups of the idouble bells in the same order as the first image. Though out of production for some time, the Olds "Super" cornets, trumpets and trombones are to this day very popular and in such demand that we see quite a few coming in for restoration. This Olds cornet was not only rebuilt but the owner requested that we fabricate the needed parts and install a first valve trigger. We have done this on a number of occasions (even on the student Ambassador model) and prefer to pattern the mechanism after that used on the original Olds "Mendez' model. 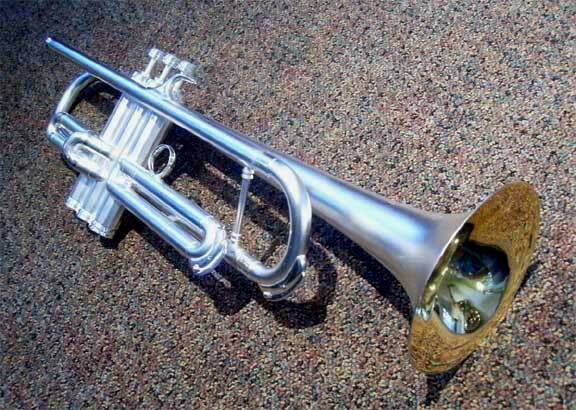 The cornet was severely damaged and worn but once repaired and refinished in a brilliant clear lacquer finish it turned out to be a real beautiful instrument. 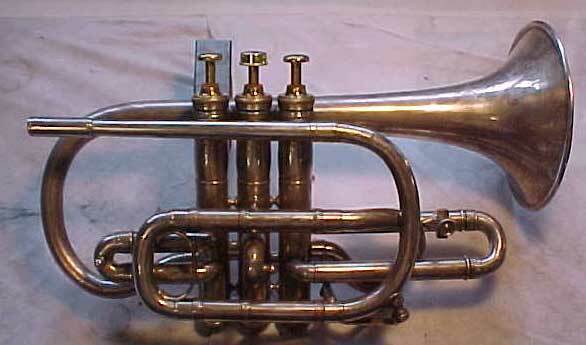 This is a Distin Superior cornet made in the late 1800's. Wow, where do we begin? This instrument had extensive acid etch, a split bell and bell rim and split slide tube seams. Also the motuhpipe had to be replaced. Dan went to great lengths to restore the beauty of the original design and engraving. 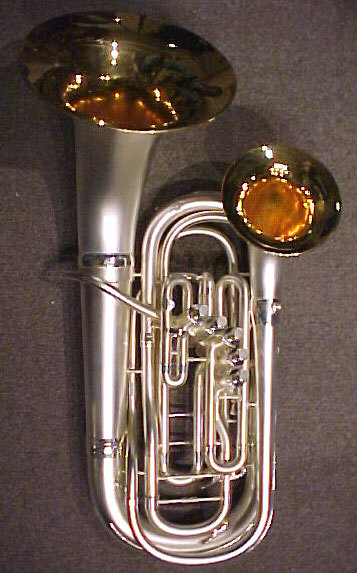 The cornet was finished in a satin gold plate. 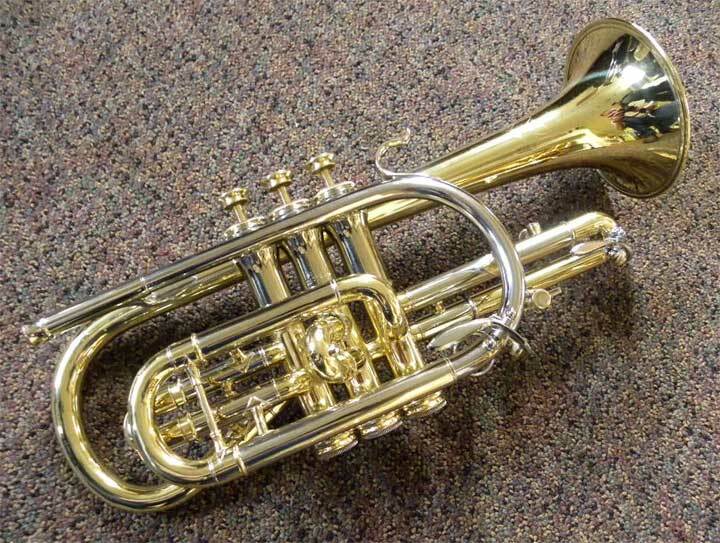 Here is a Lyon & Healy cornet that was brought in to us. The cornet was in very poor condition, lots of dents, lots of scars from other's previous repairs, split tubes, weak spots in the metal... another resurrection! This instrument turned out to be one heckuva player, great tone and great intonation. And a beaut to boot! 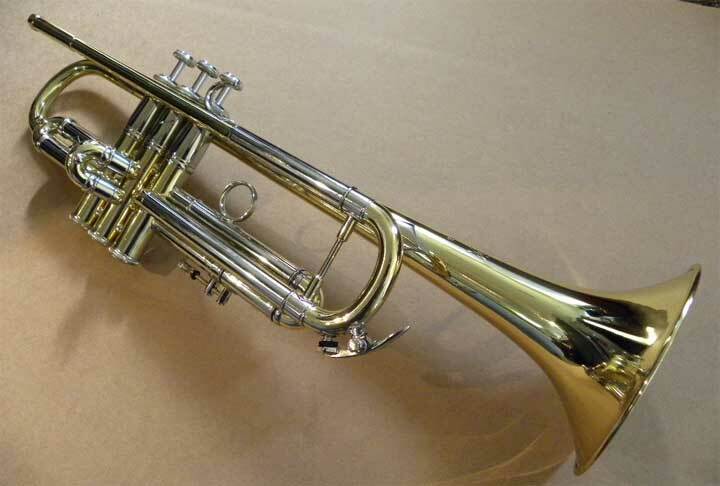 The cornet received a satin silver finish with a bright gold bell interior. 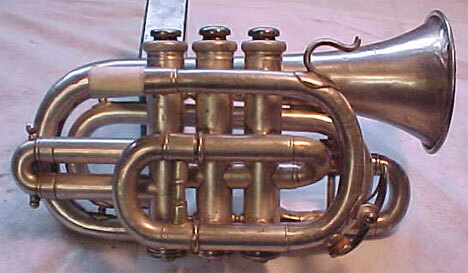 This is a Conn Wonder cornet made at the end of the 19th century! Looks pretty good for well over one hundred years old! We finished this in October 2004 for a local professional player and teacher. 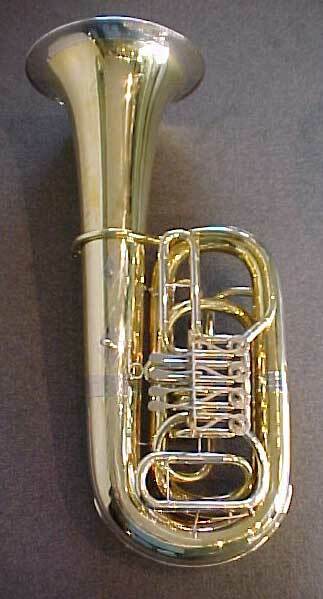 The cornet was originally purchased by his great grandfather. Click on the above picture for more details and photos. 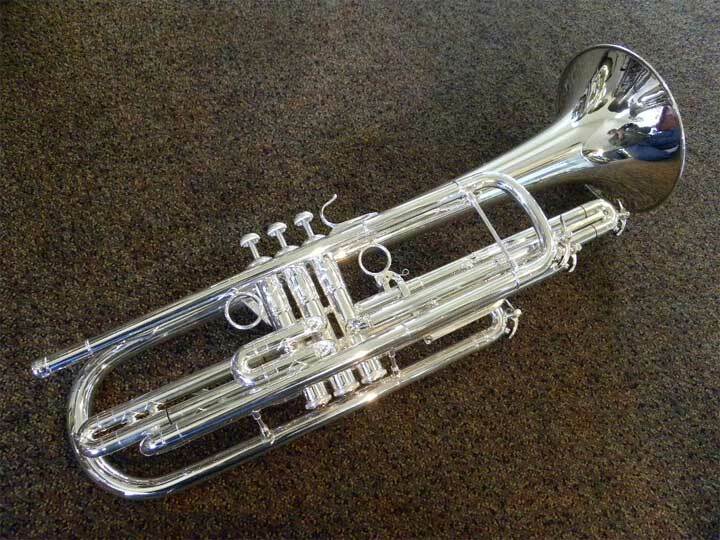 This is a Lyon and Healy pocket cornet, recently completed in a satin silver finish with a gold bell interior. Though not the best built horn we've seen, once the factory flaws were corrected in addition to the extensive damage it received over the past 115 years, it is a surprisingly fine playing cornet. The job also required manufacturing a replacement mouthpipe and Bb bit as the originals were missing or not salvageable. 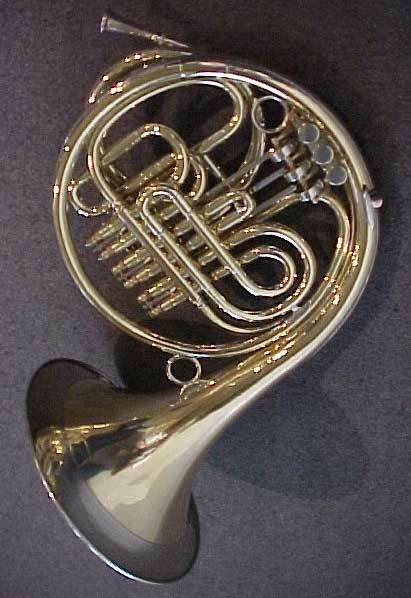 The horn was manufactured by Jaubert and sold under the Lyon and Healy brand. 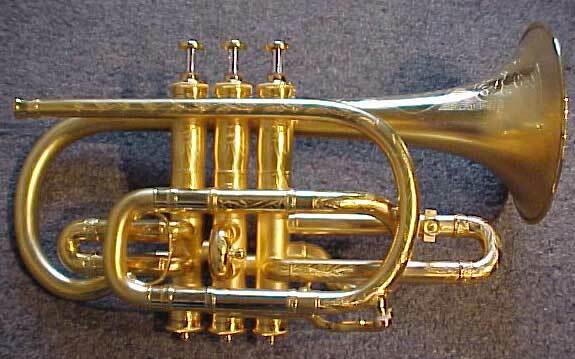 This is a Lyon & Healy Inspiration cornet. When it came in, the bell was crunched and the second valve slide was completely missing amongst other signs of the ravages of time. We restored this in a satin silver finish and gold plated bell interior. We will be bringing more pictures of this soon. Wow!! Finished in the end of August 2004, this major task took several years to complete. 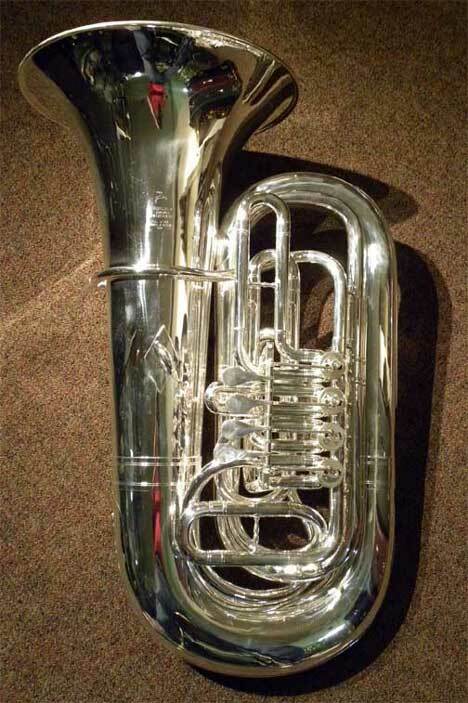 Originally this 6/4 Martin BBb tuba had three upright piston valves. Dan converted this to four front action pistons which necessitated reversing the tubing of the body and replacing the valve cluster. For more on this beauty click on the above picture. Click here for the archives showing more completed projects!